Supersolids are theorized materials with atoms that are arranged in the spatial periodicity of crystals, but are able to flow like a liquid when exposed to extremely cold conditions. In essence, they are solids that can flow like a liquid. Because of their unique characteristics, researchers have tried to create them in the lab, but until now, have met with little success. In these three new efforts, all three teams claim to have used theory and experimentation to show dipolar quantum gasses can support a state of supersolid properties—all three teams accomplished this using Bose-Einstein condensates (BECs), which are notably superfluids. Most efforts to create supersolids have started with attempts to force a superfluid into a crystal-like structure while maintaining its ability to flow—but such efforts have not panned out. Back in 2003, two teams of researchers proposed the idea of engineering atomic interactions by way of long-range dipolar coupling—an idea that showed promise but still did not lead to the creation of a supersolid. All three teams in these new efforts have based their efforts on this idea by using BECs because they have naturally strong magnetic dipole moments, believed to be a necessary part of creating a supersolid. 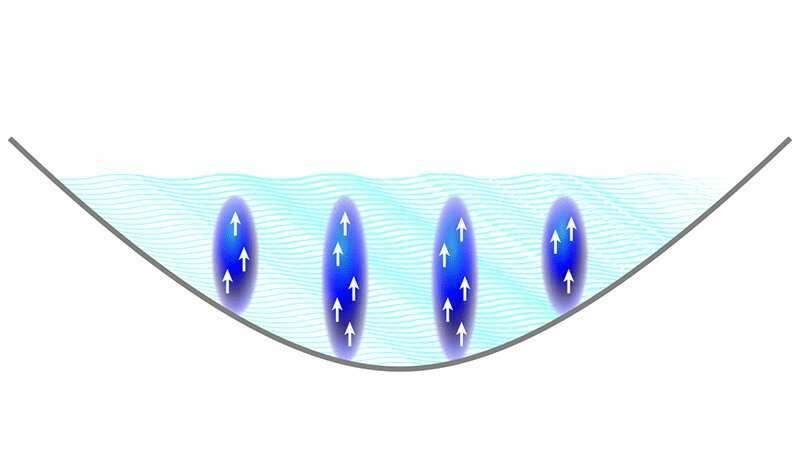 All three teams worked with the idea that dense "droplets" will form in a BEC under the right conditions, in which just the right interactions would result in coherence between the droplets, allowing for the creation of a crystalline structure—all while maintaining the flow properties of the original BEC. Two of the teams, those led by Modugno and Pfau, used the isotope dysprosium-162 in their work because of the repulsive forces that dominate dipolar interactions. The third team used two other isotopes, dysprosium-164 and erbium-166 because of their dominant dipolar interactions. In the end, all three demonstrated that dipolar gases can be used to show properties of a supersolid in a material.